I’m not sure what it is about grooms from the UK and brides from California, but I have pretty good track record so far for being honored as the officiant of such couples. Last night, Brie Hassall and Simon Donoghue tied the knot on the pool deck of the Crowne Plaza Hotel on the Redondo Beach pier. The guys were dashing in their gray suits, pale green boutonnieres, and hot pink ties, which matched the pink and black bridesmaids’ dresses worn by the rest of the wedding party. As the sun set over the Pacific behind me, the couple recited their vows and exchanged rings in a touching, simple ceremony. The groom’s family and guests from Wales were hoping for warmer weather, but at least last week’s rains moved out just in time for the wedding. Thanks again, Brie and Simon, for including me as your officiant. 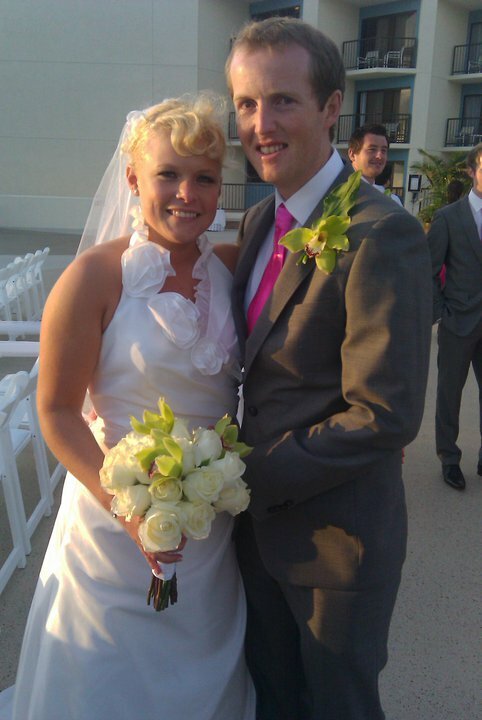 This entry was posted in wedding and tagged celebrant, Crowne Plaza, Redondo Beach, wedding officiant. Bookmark the permalink. I think that it is on such occasions when a marriage celebrant would be of great help. Two people from different cultures tying the knot in a special wedding ceremony. Good job! Simon and I agree…October 23 was by far the best day of our lives. We’ve never seen so much laughter and tears come from the ones whom are close to us. You touched upon emotions we did not even know existed. We owe you our hearts, and for that we promise to enjoy our live together for ever more!